The little speech, "Zug the Megasaurus presents the Dinosaur Discovery Kit," begins one of the cutest dinosaur programs around. Designed to entertain and educate the preschool and kindergarten set, Dinosaur Discovery is a careful combination of speech, attractive graphics, and simple layout. From the main menu, Dinosaur Discovery Kit provides access to three different kinds of activities, each one carefully designed to appeal to the most demanding three- to eight-year-old child. Large boxes contain names and icons for the Coloring Book, Dinosaur Match, Story Maker, and Quit options. Zug appears dressed in different outfits each time the menu comes up. There is a help menu that includes several useful control options, including volume, printer access, and the ability to personalize the program with your child's name. Zug's coloring book features accurate drawings of six different dinosaurs, each in an appropriate environment. There is just enough detail to keep preschoolers entertained without overtaxing their attention span. As each picture is completed, Zug randomly states one of several amazing facts about that particular type of dinosaur. Pictures can be printed at any time, a useful feature if your children would rather do their own coloring or want to keep a record of their work. Dinosaur Match is a well-constructed version of a traditional memory game that offers enough variety to satisfy a wide range of age groups. Younger users will want to play by themselves with large cards and real dinosaurs, or they may try their ability in a contest against Silly Zug. 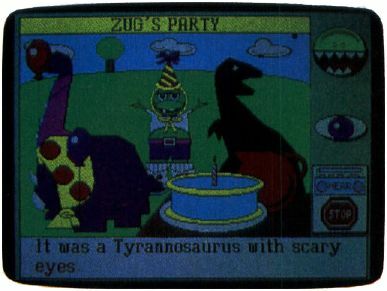 Older kids might challenge Very Smart Zug to an 18-card game of Dinosaur shadows. If you can beat Zug, he'll present you with an award. Children can create their own fantastic parties with Dinosaur Discovery Kit. Story Maker combines fantasy and reality into user-made stories that encourage nonreaders to build connections between written and spoken words. After your child has selected a title for the story, the program displays the first sentence onscreen and recites it. The sentence is missing a word at the end; to complete it, your child must choose from the available words. After the choice has been made, an appropriate image appears on the screen and Zug patiently reads each sentence. Is the triceratops wearing a striped bow or a polka-dotted scarf? Will the brontosaur hide from two allosaurs or two tyrannosaurs? When the story is finished, you can choose to print out the story and the pictures as a book or to let Zug read you the story a sentence at a time. Speaking of speech, Dinosaur Discovery Kit uses the new Smooth Talker technology from First Byte; the Macintosh and Amiga versions are astonishingly clear. While the Tandy 1000 and MS-DOS version suffer in comparison, they are also clearly understandable and even feature a rather attractive accent. Despite the strength of the overall program, there are some irritating weaknesses. The overall lack of a backup or undo option is quite frustrating for older children. Although the speech is quite clear, it's not used consistently. The speaking of some menu items can be turned on and off, but even with all the speech options on, some important menu items are never spoken. The Story Maker and Coloring Book sections could profit from larger selections of pictures, colors, titles, and perhaps some branching stories. For classroom use, simple recordkeeping and a story-editor mode for the teacher would be very useful. And if you only have CGA graphics, be warned that the install routine is a bit tricky. The Dinosaur Discovery Kit is attractive, educational, fun, and highly entertaining. Young children will like the simplicity of design and attractive results. Older kids will find the combination of fantasy and reality appealing. No bones about it, Dinosaur Discovery Kit is a wonderful program that makes good use of the newest in speech technology to entertain and educate.